Israel's recent attack on a flotilla delivering humanitarian aid to Gaza, killing at least nine people, suggests a growing indifference of the Israeli government to global condemnation of its Palestine policies. Yet at the same time Israel appears to be actively concerned to shape itself as a benign and even progressive democracy. Israel is invested in a large-scale, massively funded Brand Israel campaign, produced by the Israeli foreign ministry, to counter its growing reputation as an imperial aggressor – it was ranked 194 out of 200 nations in a recent East West Communications survey in terms of "positive perception". Targeting global cities such as New York, Toronto and London, the Brand Israel campaign has used events such as film festivals to promote its image as cultured and modern. One of the most remarkable features of the Brand Israel campaign is the marketing of a modern Israel as a gay-friendly Israel. Stand With US, a self-declared Zionist organisation, has been quoted in the Jerusalem Post as saying: "We decided to improve Israel's image through the gay community in Israel." This "pinkwashing", as it is now commonly termed in activist circles, has currency beyond Israeli gay groups. Within global gay and lesbian organising circuits, to be gay friendly is to be modern, cosmopolitan, developed, first-world, global north, and, most significantly, democratic. through the gay community in Israel"
Events such as WorldPride 2006 hosted in Jerusalem and "Out in Israel" recently held in San Francisco highlight Israel as a country committed to democratic ideals of freedom for all, including gays and lesbians. Yet pinkwashing obscures the much more foundational, intractable and, by the terms of the Israeli constitution, necessary lack of freedom that Palestinians have in regards to Israeli state oppression. Israeli pinkwashing is a potent method through which the terms of Israeli occupation of Palestine are reiterated – Israel is civilised, Palestinians are barbaric, homophobic, uncivilised, suicide-bombing fanatics. 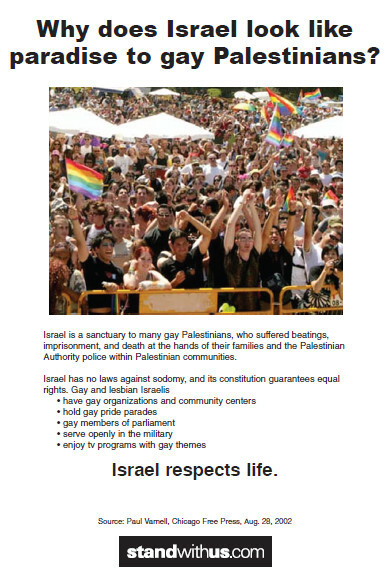 It produces Israel as the only gay-friendly country in an otherwise hostile region. This has manifold effects: it denies Israeli homophobic oppression of its own gays and lesbians, of which there is plenty, and it recruits, often unwittingly, gays and lesbians of other countries into a collusion with Israeli violence towards Palestine. In reproducing orientalist tropes of Palestinian sexual backwardness, it also denies the impact of colonial occupation on the degradation and containment of Palestinian cultural norms and values. Pinkwashing harnesses global gays as a new source of affiliation, recruiting liberal gays into a dirty bargaining of their own safety against the continued oppression of Palestinians, now perforce rebranded as "gay unfriendly". This strategy then also works to elide the presence of numerous Palestinian gay and lesbian organisations, for example Palestinian Queers for Boycott, Divestment and Sanctions (PQBDS). Pinkwashing is not being produced by Israeli government quarters alone. After the Gaza invasion of January 2008, many educators in the United States signed a letter, addressed to Barack Obama, generated by Teachers Against Occupation condemning the invasion. About six months later, those who signed the petition received a request from one of the signatories to endorse a letter condemning homophobia and oppression against women in Palestine, the Middle East and northern Africa – regions that are not all defined by Islamic religious dominance, but were nonetheless targeted for their adherence to repressive Muslim cultural norms. by liberal supporters of the Palestinian cause. "Israel: Stop persecuting Palestine!" "Palestine: Stop persecuting queers!" This particular response, whereby a stance against Israeli state violence is advocated and sanctioned but accompanied by an additional condemnation of Muslim sexual cultures, has become a standard rhetorical framing produced by liberal supporters of the Palestinian cause. 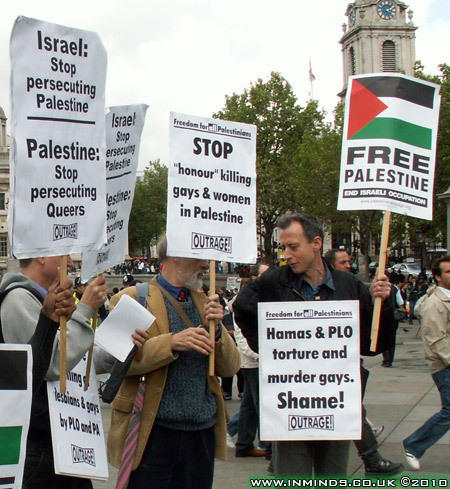 (Note the messaging of OutRage, Britain's premier queer human rights organisation, at a Free Palestine rally in London, 21 May 2005: "Israel: Stop persecuting Palestine!" "Palestine: Stop persecuting queers!" 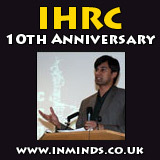 and also "Stop 'honour' killing women and gays in Palestine".) This framing has the effect, however unintended, of analogising Israeli state oppression of Palestinians to Palestinian oppression of their gays and lesbians, as if the two were equivalent or contiguous. More importantly, it dilutes solidarity with the Palestinian cause by reiterating the terms upon which Israel justifies its violence: Palestinians are too backwards, uncivilised, and unmodern to have their own state, much less treat homosexuals properly. The politics of solidarity with Palestine must not be undermined by such an uncomplicated stance. All told, however, pinkwashing is a depleted strategy that ultimately discloses the desperation of the Israeli state. Just as Brand Israel's strategy of recruiting cultural icons to promote Israel's modernity has faltered in the face of high-profile cancellations of concerts and other events, its efforts are being widely contested, especially at gay and lesbian events and despite the censorship of gay and lesbian groups that actively oppose the Israeli occupation. The recent banning of the phrase "Israeli apartheid" during Pride weekend by Pride Toronto, in response to pressure by the city of Toronto and Israeli lobby groups, effectively barred the group Queers Against Israeli Apartheid (QUAIA). However, on 23 June the ban was rescinded in response to community activism and the 23 Pride award recipients who returned their prizes in protest of the ban. Frameline's San Francisco LGBT film festival faced opposition from Queers Undermining Israeli Terrorism (Quit), among other groups, for accepting Israeli government sponsorship. Last week, after protests by Palestinian, Arab, Muslim, and other anti-Zionist factions, the US Social Forum in Detroit cancelled a workshop slated to be held by Stand With Us on "LGBTQI Liberation in the Middle East", which sought to promote images of Israel as a gay paradise at the expense of Palestinian liberation. While Israel may blatantly disregard global outrage about its wartime activities, it nonetheless has deep stakes in projecting its image as a liberal society of tolerance, in particular homosexual tolerance. These two tendencies should not be seen as contradictory, rather constitutive of the very mechanisms by which a liberal democracy sanctions its own totalitarian regimes. Madrid has banned an Israeli delegation from the city's gay pride parade in protest at last week's Gaza flotilla raid.